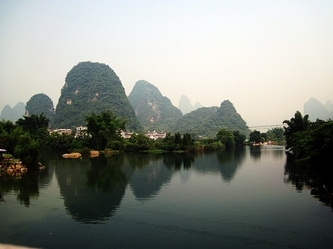 Yangshuo located near Guilin City in China is a major tourist destination located in Guanxi Province in the south of China. 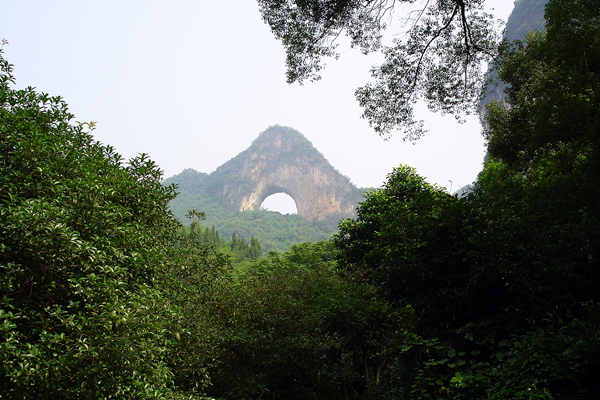 The area has some of the most karst mountain landscapes in the world. The views are nothing sort of breathtaking. 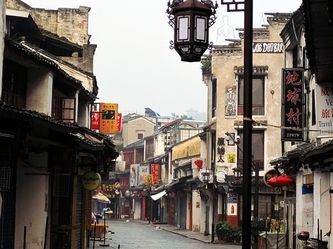 The paradise of adventurous backpacker that seek for wildlife getaway and many outdoor activities available at low cost such as rock climbing, abseiling, bamboo rafting, hiking and cyling trip through the karst scenery.The atmosphere in Yangshuo is a unique one and the streets are usually filled with westerners and most of the shops, restaurants, hotels and barsare designed to cater to them, making it a unique blend of cultures in Yangshuo. 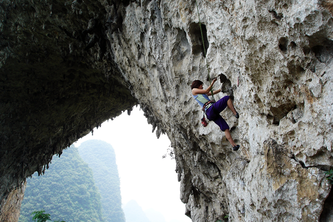 Yangshuo now becomes one of the most popular rock climbing destinations in China and Asia, with around 300 bolted sport climbing routes and some multi-pitch trad climbing. The first route was bolted and climbed by American climber Todd Skinner in 1990 on Moon Hill and new routes are up regularly with still many more undiscovered potential climbs to be explored. 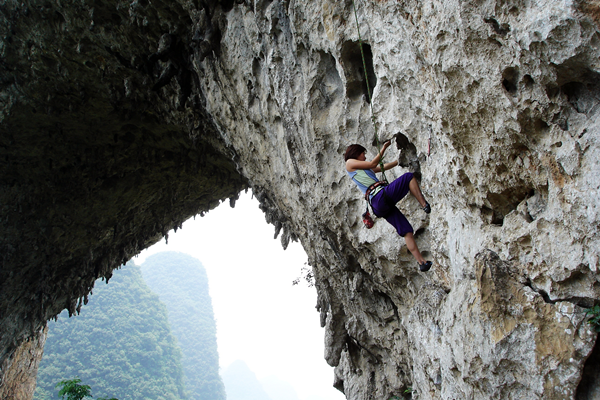 i believe rock climbing in Yangshuo will be developed as fast as another world's climbing destination. 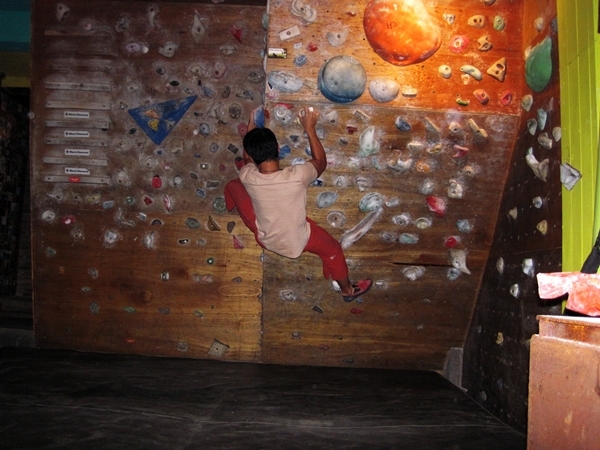 There are several rock-climbing operators in town that offer climbing guide and equipments rental. Standards vary and it is worth getting local advice, especially if you are a total beginner. Beginners are welcome, and well-catered for. Instruction can be given and suitable crags chosen for pretty much any age and level of fitness. Give it a go. You may end up taking up rock-climbing back home. 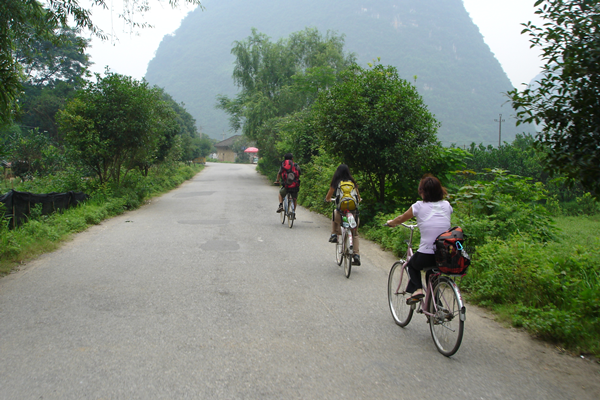 4th June 2010, our first visit to YangShuo for exploring the climbs with budgeted in mind. we were recommended to stay in the West Street at price of Y60/night, the room was nice, clean and with mountains river view. Walk out of the hostel and you get whatever you want right along the street. With just a climbing guide book, rent a bicycle at Y5/day and cycling to the climbing crags in 30-45mins. Along the journey pass by villages, greenery farms, rivers and karst mountains, kind of fun and relax other than climbing. For those want to save energy and times for more climb could alternately hire a rock climbing guide include of transfers to the climbing crags and return. 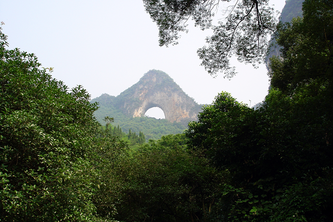 For self-guided,the YangShuo Rock Climbing guide book is available for purchase at most of the rock climbing shops there. With such a short trip of 5days, we spent 3days for rock climbing and managed to try out some of the signature crags such as Moon Hill, Baby Frog Buttress and White Mountain. 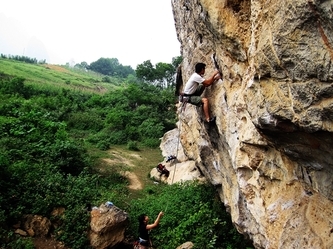 Among these crags, we voted Moon Hill the best climb and crag in our trip. Access to Moon Hill required hiking of 30mins and entrance fee of Y15, we attempted some climbs graded at 6B and that was really long climbs with beautiful scenery view at the top of the wall. The weather was so windy and cooling without a sweat even after several of climbs. NICE!!! rock climbing at Moon Hill is highly recommended!!! Baby Frog Buttress has numbers of the beginner's route, hence found many guiding operators around and they was friendly enough to show you the route and climbs. White Mountain features technical, pumpy overhanging and polished climb, many routes are bolted newly by foreign climber during their visit here, we did not climb much as most of the routes missing the first bolt, and we told by local climber that was possibly removed by the villagers of that area to restrict climbing. Remember to bring along the clipping stick if you plan to climb at this crag. At night after the dinner, we check out the bouldering gym in West Street call "China Climb". here's where you find the climbers hanging around for bouldering, sharing the knowledge of climbing here and there. Try your luck to find your climbing partner there! 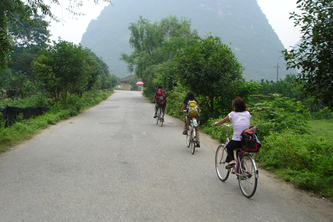 Wandering through the countryside on a bike and getting lost is one of the best things about Yangshuo. The villages often have dramatic mountain backdrops, and the people are generally friendly. Travel at your pace to discover the hidden corners. Bike hire starts at Y5 per day. Better bikes cost from 30 - 50 Yuan for the day. 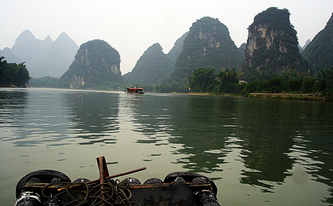 Another way to check out the beauty of Yangshuo, on bamboo raft Its relaxing and nostalgic. 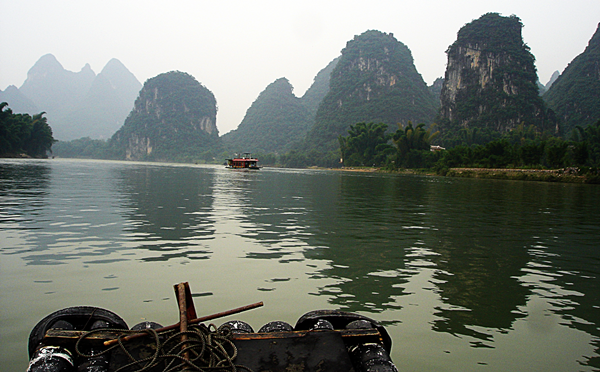 Exploring Yulong River on a simple bamboo raft is a great experience where visitors should never miss. You can sit in a bamboo chair, float down the river and get back to nature. The water is clear and the scenery along the river is dramatic. Along the way you can see mountains, farmers, water buffalo, bird flying and even hear farmers singing and playing flute. It is a relaxing and idyllic retreat. Our last destination in Guilin was visiting the popular rice terrace In Longsheng County of Guilin, a area is known as Longji, which means the dragon's backbone in Chinese. It is an area where the entire mountain range is covered with terraced rice fields. They were built over more than a thousand years and also exceptionally beautiful and different during the four seasons The shinning terraces lace the mountain slopes like silver ribbons in spring. And summer breezes ripple the surface of the paddies in great waves. In fall layers of yellow crops make golden pagodas, and in winter hosts white snow dragons are said to make the terraces their home.